A deal too good not to share. Realizing it doesn’t apply to all, probably most, ignore that part and take my Thanksgiving greeting. We’re off to the cousin’s for some gobble-gobble goodness. My morning has been spent drinking coffee, making pumpkin bread. It’s hard not to have the smells of Thanksgiving festivity in the house (since I’m not hosting). The bread helped with that problem. Peace, love and gratitude for an abundance of joy. For you visual folk, I’ll throw out a couple pictures. But I’ll have you know, I took them with my phone. On purpose. Because I can. And because, frankly, I’m a somewhat die-hard, old-school blogger who likes her blogs a little rough around the edges. I’ve tired of the magazine-like blogs with nearly professional photos with templates that cost as much as my monthly mortgage, and narcissism so thick I have to wipe my screen off when I’m done. I’ma keep it real with my ghetto-photos today. Every now and then I dust off the old bread machine and revisit the art of making bread in a machine. Most recently I was prompted by the need to whip up some pizza crusts, fast. Being short on time, and NOT wanting a frantic situation to turn into a $30-dollar take-out evening, I ran down to get my machine, thinking I could throw the ingredients in, run to do my kid pick up, and come home to quick make some pizzas. Even though it didn’t work out perfectly, it did turn back on the lightbulb regarding the machine, and its usefulness in the kitchen. I can’t claim to have mastered bread making, to have a “favorite” recipe, or to say that I’ve made a switchover from store-bought to homemade. But I can say that I dabble in it, experimenting, contemplating. I’ve made bread in the machine enough to know I’m not wild about bread machine bread. Granted, my machine is over a decade old. There may be a whole new generation of machines that bake up a more pleasing loaf but my 2-lb. Oster 5834… not so much. (If you’ve picked up an Oster 5834 at a thrift shop [or are dusting it off from storage] and need for the manual for the Oster 5834 bread machine, you can download it here: Oster 5834 Breadmaker Manual. Replacement Parts: Sunbeam / Oster Breadmaker Paddle , Bread Pan , and Instruction Book – if you don’t want to download it here for free. Order of adding ingrediants to your breadmaker: FIRST-liquid ingredients, SECOND-dry ingredients, LAST-yeast. What I like least about bread machines is the bread they bake. What I like most about bread machines is the dough they make. So, basically what I love about bread machines is that it is like having your own little apprentice in the kitchen with you. I can plop in the water, oil, flour, salt and yeast in– and forget it! Sort of. I like to peer through the window and watch it knead, and sometimes it needs a little more flour, or liquid. But, for the most part – you set it and let it work while you move on to other things. Love it. So, last night at… oh, about 10pm I decided to throw a loaf in the machine and try a new recipe. No clue why I waited right up until I was about to go tuck in an read, but I can’t claim everything I do makes sense. I think I just wanted to feel like I was being productive. I like to have something going at night, “working” while I’m getting ready for bed (load of laundry, beans in the crockpot, etc.). Last night it was bread. After adding the ingredients, and then spying on it for a while, I puttered around the house, waiting for Frank (working OT 2nd shift) to get home. I wanted to stay up long enough to warm up his dinner (chorizo tacos), say “hi” and then throw myself down the stairs and slide under the covers. But I kept worrying about the bread. I mean, it would be done at 1am and shouldn’t I be taking it out of the machine when it is done baking? What would happen if I didn’t? At 12:30am the machine had 49 minutes left on the timer. I, however, only had about 5 min. left in me. Frank was already burning midnight oil after working two shifts, and having to be back to work again at 7am. He was showering and then throwing himself into bed, too. I couldn’t quite bully him into staying up and waiting on my bread (which he would have, if he didn’t have to get up a few hours later). I was pretty sure that my anxiety over my bread would keep me awake that extra 49 minutes anyway. So I read a few pages of The Help (my bookclub pick), and find my eyes falling heavy. Bowzer snuggles up to me, increasing the cozy factor. My heated blanket starts to kick in. The smell of warm, homemade bread baking drifts through the house. Twenty minutes. Twenty? The glass of wine I drank while googling recipes is calling me to nighty-night. I know that even if the buzzer on my oven was blaring through the house right now, I’d pull the covers higher up on my chin, roll over and start to drool. There was no way I was going to come out from under those covers, traipse upstairs and remove that bread from the machine in twenty minutes. This morning I found the bread, sitting on the cutting board, underneath the towel that I had left out. Paddle, stuck in the bottom. Frank must have took it out before he left for work. I broke out my bread slicer (a wooden contraption found at Goodwill for $2) and cut Lootie a slice. He ate it with butter and jam. Drove the kids to school, came home, sliced off a hunk for myself, fried up some eggs and prepared to feast. Not bad. Better, had it been cooked up in the oven I’m betting (and that’s what I’ll try next). But for the little effort it took, hey, I’m OK with that. 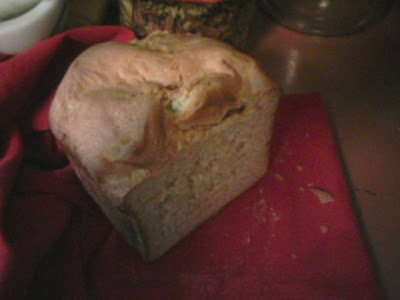 The recipe I used is called “Best Bread Machine Bread” on Allrecipes.com. Try it and see what you think. If you want. The fun part about it is that it defies everything you’ve had beaten into your head regarding making bread in the machine: LIQUID, DRY, YEAST. LIQUID, DRY, YEAST, LIQUID, DRY, YEAST!!! This recipe has you put the liquid, yeast and sugar in first, let it sit 10 minutes, and then add the flour and yeast. Worked fine, my kitchen is still intact. Bread was decent, but my final decision on the recipe won’t come until I make bake it in the oven. 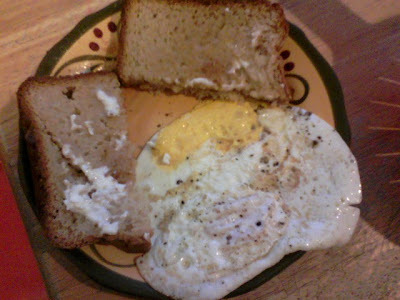 My breakfast, with the bread, toasted. 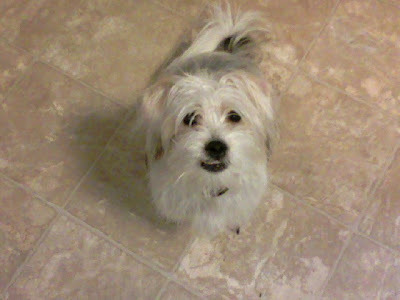 Bowzer, hoping he’s included in this whole breakfast-eating fun. There’s no hiding his massive under bite and snaggle-tooth. I love him anyway.